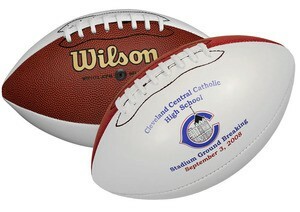 High quality synthetic leather sport balls with white signature panels. Full color heat transfer imprint area 4-1/2"W x 2-3/4"H oval. Full color transfer set up charge $50.00(F). Full color transfer up charge $2.67(F), additional location $.60(F).